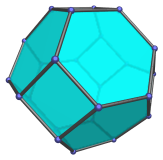 The truncated octahedron is a 3D uniform polyhedron bounded by 8 hexagonal faces and 6 squares. 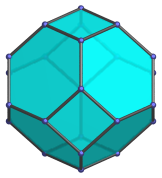 It may be constructed by truncating the octahedron at 1/3 of its edge length. Parallel projection centered on a square face. The top, bottom, left, and right edges of the projection envelope are images of square faces. 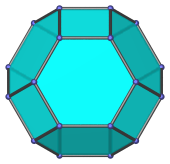 Parallel projection centered on a hexagonal face. 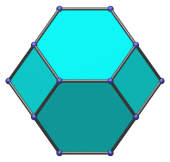 Parallel projection centered on an edge between two hexagons. The top and bottom edges of the projection envelope are images of square faces. 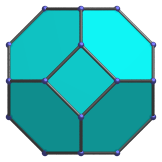 Parallel projection centered on a vertex. Last updated 16 Jan 2019.